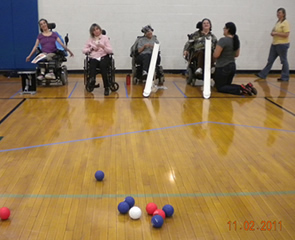 Currently, M-NASR offers a variety of Adapted Boccia programs including Recreational and Competitive ongoing programs, Adapted Boccia Club and monthly local tournaments. A current Paralympic sport, Adapted Boccia is based on strategy, focus and self-control, and the athletes in our programs pride themselves on being a part of M-NASR’s first Adapted Sports team. With practices offered twice a week and the opportunity to attend competitions throughout the year including Great Lakes Regional Games and Boccia Nationals, our athletes are able to demonstrate their passion, determination, confidence and independence through the camaraderie of M-NASR’s team! M-NASR is an active member of the Northern Illinois Paralympic Sport Club, a partner of U.S. Paralympics and co-operative organization of Special Recreation Associations in Northern Illinois. This club’s purpose is to involve youth and adults with physical and visual disabilities in sports and physical activity, regardless of skill level. Through our involvement in this club M-NASR not only provides our own excellent adapted sports programs, but also works to connect participants with other agencies in the club that may offer additional adapted sports opportunities, such as Track & Field, Wheelchair Basketball, Judo, Goal Ball and many more. For more information about Paralympic Sports, Northern Illinois Paralympic Sport Club or Adapted Boccia, please contact us at 847-966-5522.